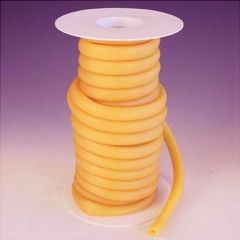 Hygienic natural rubber tubing made of natural rubber. It is seamless, flexible and smooth with excellent tensile strength. Note: The 50 foot roll of tubing comes in various lengths on the roll, it is not one continuous roll. Length between cuts is determined at the manufacturing plant and is not labeled on each roll.